How does a predominantly online bank handle depositing your paper checks into your online checking account? ING Direct does not do it. You are just out of luck with the Bank of the Internet, ING Direct, and others like them that are solely on the internet. You can’t deposit paper checks with them. They simply just do not accept them. But, USAA, a financial services company that has an online bank which serves members of the military, veterans, and their family members knows a way around this problem. They let you take a picture of the check with your iPhone. Now, USAA is changing the way its 7.4 million members can buy a new or used car. USAA is a financial services company that has banking, investments, insurance products, and financial planning all under one roof, and they are harnessing that synergy to give its customers a one stop car buying experience that starts with research and then progresses all the way through buying, financing, and insuring your next car purchase all in one location on the internet. And if that wasn’t enough, they even put it all into an iPhone app! Now, you can buy, finance, and insure a car all from your cell phone! 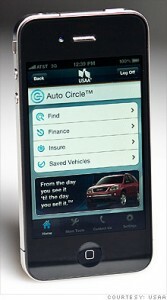 USAA is launching a complete car buying experience on its website August 4th called Auto Circle. 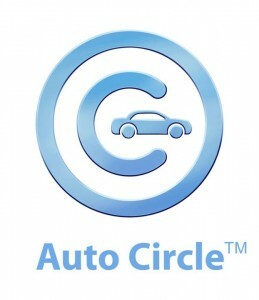 The new program brings together all of USAA’s separate financial divisions and products under one online portal at www.autocircle.com that will streamline and ease the process for their customers. The folks at USAA, who brought you an iPhone app that lets you deposit a check in your bank account from home, are including Auto Circle on the next version of the bank’s iPhone app that is already available from Apple’s App Store. The new upgrade to the USAA homepage app on the iPhone and Touch iPods will be available the same day the Auto Circle website launches, August 4th. You will be able to buy, finance, and insure your car all from your iPhone. One of my favorite aspects of USAA’s Auto Circle program is its research features. Thanks to the wealth of You can research different cars, both new and used, that are available through a dealer network of over 3,500 dealerships across America that have been vetted by the folks over at USAA. When you find one you like, you see an incredible wealth of pricing data. You see what the MSRP, dealer’s costs, discounts available, and the price that USAA’s car buying service can get for you. USAA is also rolling out a comprehensive list of USAA preferred automobiles that they feel are wonderful potential selections for their members to purchase. USAA has painstakingly rated new cars based on factors such as reliability, safety, fuel economy, price, and of course insurance cost. There is also a place for USAA’s members to provide feedback to one another on cars that they liked or did not like and why. 80% of people know what kind of car they want before they walk into the dealership thanks to the recommendations of their friends, family, and coworkers. Now, you can tap into over seven million of your newest friends to help tell you which cars are the best to consider buying and which ones to stay away from. When you find a car at a preferred dealer that you want to purchase, you can download and print a price guarantee certificate to take to that dealership in USAA’s network. You are guaranteed the price on your new dream car which was negotiated through USAA’s car buying service on its customers’ behalf. Or, you can try your negotiation skills around town with your certificate in your hand as a tool or a backup. How cool would it be to have a price ceiling on what your dream car will cost you and your financing from the bank already in place as well? That is a lot of leverage that you can use against a dealer to try and negotiate an even better deal with the security of a price guarantee to fall back on. I have seen firsthand some of the innovative ideas and products that USAA is coming out with in the near future. It should be no surprise that a company that broke the mold on depositing checks by taking a picture or scanning them instead of mailing them into your bank would come up with an iPhone app that would let you buy a car all the way through the process from idea, research, loan, purchase, and insurance. I am very appreciative for USAA flying me out to San Antonio to check out their headquarters and their new products like Auto Circle. I truly believe that Auto Circle will be a great experience for customers of USAA who are looking to buy a new or used car and who are fed up with the old way of doing it and getting taken advantage of. Next post: When is the Best Time To Refinance Your Home?